If you want to enhance skin with a gorgeous glow or want a pick me up for dreary winter skin then bronzing is the way to go. Application of bronzer can be a tricky thing, when using bronzer we are trying to create that sun kissed glow. For Powder: Use an angled contour brush. For Cream: Use a synthetic contour brush, a foundation brush or your fingers. For Gel: Use a buffing brush or your fingers. If you find bronzer just looks funny on your skin try using a bronzing BB Cream. You can also mix a small amount gel bronzer and bronze toned illuminators in with foundation, they make the skin look glowy and bronzed. 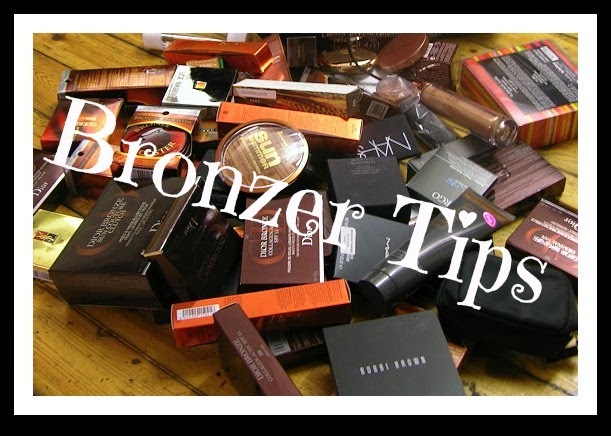 The best way to apply bronzer is in a “3” shape, this way bronzer is applied where the sun naturally kisses your skin. 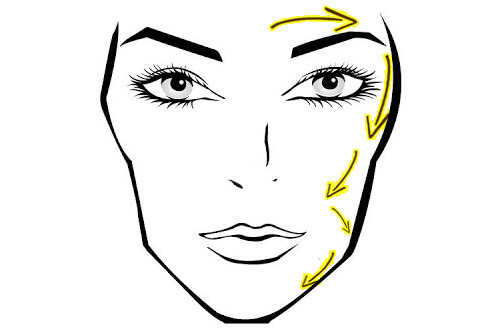 - Apply the bronzer around the hairline, the temples, the edges of the cheeks and around the jaw line & chin. - Always use the smallest strokes and use brushes gently to avoid applying too much product on the skin. - If you accidentally use too much bronzer, use a small amount of foundation that matches your skin tone on a foundation brush to tone down the color. - Apply on or just under the cheek bones, then blend upwards onto the cheeks. You can also lightly apply a shimmery blush just above the cheekbones for a sunny glow. - Apply bronzer along the temples and top of your forehead to give a sun kissed glow. - Pick your correct shade- you want 2-3 shades darker than your skin. - Shimmery bronzer or a Matte finish - A matte bronzer can also be used as a blush or for instant color all over the face. A shimmery bronzer should only be used on the eyes and the cheeks. Knowing which finish to use is essential. Matte: Perfect for bronzing the face without being overly obvious. The best finish to use and suitable for all skin tones and types. Shimmer: Can often appear unnatural on the skin and the shimmer reflects light so fails to make your face look slimmer. Medium to dark skin tones can wear shimmer. Light Skin tones: Light bronzers with no shimmer, bronzers with neutral tones and a hint of red or pink. Medium Skin tones: A brown bronzer with a touch of red or pink in the base and minimal shimmer is ideal. Dark Skin tones: A dark, red based bronzer with a hint of shimmer can be used. Very Dark Skin tones: The darkest shade of bronzer available, bronzer often doesn’t show up on very dark skin so opt for one with shimmer or lightly use a shimmery blush.